I liked 2011, but found it extremely annoying to say, so I’m glad we’re into Twenty Twelve. 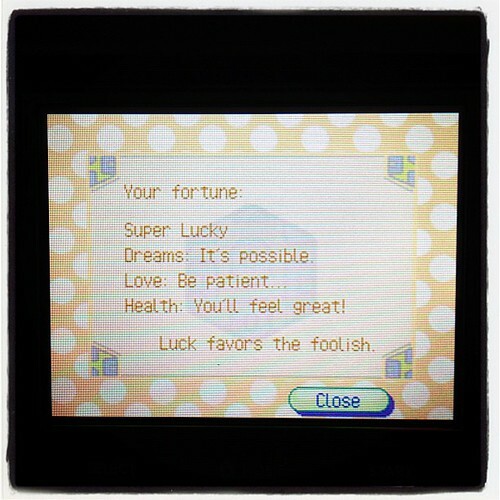 According to my fortune from Animal Crossing I’m going to be Super Lucky this year. Let’s hope so. So, how did I get on with my resolutions? Well, some good, some bad. Project Clearout was a great success – by the end of the year, I was pretty much addicted and getting rid of things that would have upset me greatly in January. I’m going to post up some tips soon in case you’re in the same boat this year. My publishing projects went well too – I got my Kawaii Japan book and 5 Year Diary published, updated my Tokyo Shopping Guide and finished a few more zines. I’ve got a couple more zines on the go just now that I hope to get up for sale soon. Plus, of course, I set up Pushpin, so it’s been a zine-filled year. And I successfully completed another 12 months of What I Wore drawings and collected them in a free zine. My new Shopify theme never got far, though I did so much Shopify work in 2011 that I have plans aplenty for when I do get the time. My graphics tablet was a sad casualty of an upgrade – Photoshop CS5 goes completely doolally when my tablet is installed. Hopefully Adobe have fixed the issue by now – I should check. My mum still hasn’t got a sewing machine so I ended up putting my fabric up for sale instead. Hopefully we can get this collaboration going in 2012. And I still haven’t been commenting much, though I do heart a lot of things in Tumblr and Instagram. I’ll carry those over as extras but here are ten things I want to do in 2012. 1. Draw more! After 2 years of What I Wore drawings, I’m a bit bored of Illustrator and so it’s time to get back to my sketchbook. I plan to do some watercolours and lino printing and share something every month. 2. Make a big decision. I still can’t decide what direction to take Asking For Trouble. I’m ready for an investment but which way to go? Trade Fairs? Licensing? PR? I need to choose one and push on. 3. Book Clearout. While I got rid of loads of books last year, I still have an enormous pile of books to read. I want to have read or ditched them all by the end of the year, with a good amount gone by July 1st. 4. Learn about fabric design. Not being a quilter, I don’t really do the whole collection thing with stripes and basics as a buyer or a designer. The fabric industry is all about collections though, so I’d like to have a go at learning all the rules I already own Lizzy House’s ebook and the True Up Field Guide to Fabric Design so I have lots of things to try. 5. Explore more. I’ve just been totting up my holiday allowance at p/t job and I only took 5 days off in the entire year! There’s been a real lack of trips in 2011, especially to new places. This year I’d like to take more short breaks and day trips. On my wish list – Portmeirion, the Isle of Wight, Skye, and I’ve already picked up a deal for a couple of days in Boat of Garten near Aviemore. 6. Answer emails. I am getting worse and worse at responding to emails promptly. Partly it’s forgetfulness/busyness, but often I get lengthy and/or bizarre emails and eventually I end up just deleting them as answering 3 months later feels even more weird. I’m going to try and respond to most emails within 24 hours, even just to say thanks, I’ll get back to you later. 7. Finish my zines. I’ve been working on a bunch of stuff this year, but I’d like the contents of my zine planning folders to either be part of published zines or deleted by the end of 2012. 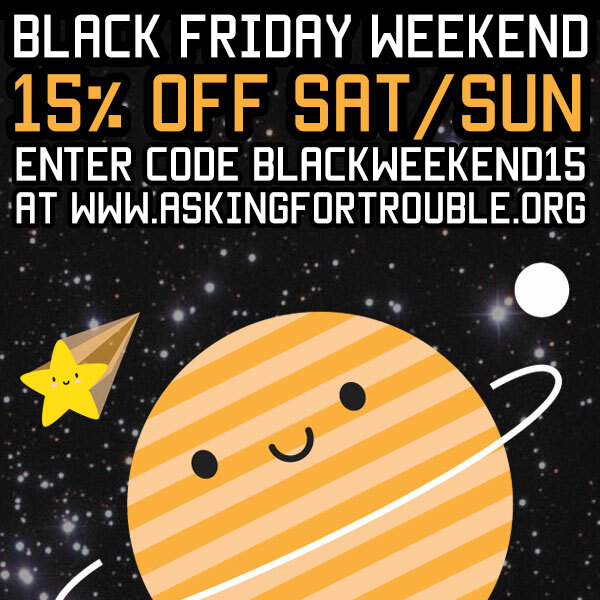 I’d especially like to get my Zelda zine, my space zine and my 2 how-to zines published. 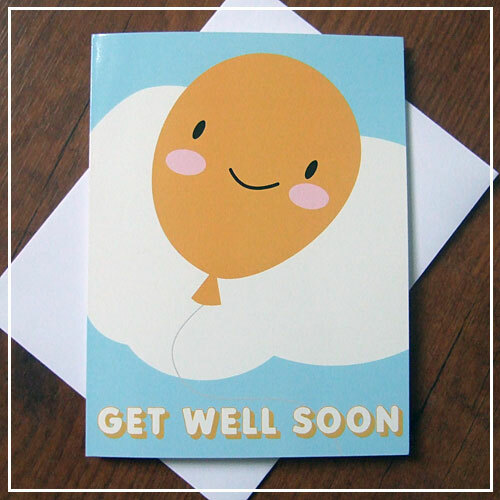 8. Review your zines. I want to do more to promote the zines I love to read, so I’m going to make the effort to post about the majority of zines I read over the next 12 months, over at I Like Zines. 9. New eats. I’m in a bit of rut with food as I tend to use my favourite ingredient combinations over and over in different ways. I’m going to make a little book collating all the recipes I’ve bookmarked and try and make something from it at least once a month. I’ve already made the booklet and now I am hungry. 10. Contact 5 scary people. I’m exaggerating, but there are a few shops I have always had in mind as dream stockists and I sometimes come across other great opportunities for my products. I’m always putting them off for another year until I do x, y and z but I’m going to actually contact 5 of them this year and see what happens. Well, that’s what I’m excited about doing this year, but no doubt 2012 has its own plans for me.